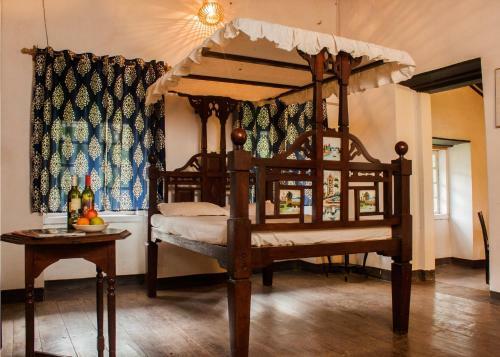 Featuring a garden and terrace, Quarto De Casa Tipri boasts old Goan décor and is located within the precincts of a 150 year old heritage home, Casa Tipri. Saligao Church is 700 metres away. Some rooms include a seating area and TV with satellite channels. The bathrooms comes with a shower and free toiletries. Quarto De Casa Tipri is 5 km from Baga and Calangute beaches. Thivim Railway Station is 18 km away while Goa International Airport is 50 km away. Guests can approach the front desk during the business hours for assistance in planning day trips. Laundry, ticketing and bike and car rental facilities can be requested. Daň ve výši 18,40 % je v ceně. Platí se celková cena rezervace nejpozději 1 den před příjezdem. Děti jsou v hotelu vítány. Za přistýlky pro všechny děti do 6 let se neplatí. Za přistýlky pro všechny další starší děti nebo dospělé se platí 300 INR na noc. Maximální počet přistýlek na pokoji je 2.